The Dictionary, Dreams-Signs-Symbols, The Source Code, helps us discover, in great depth, over 892 pages, the most common words in dreams and signs. Each word is analyzed in detail with its physical and metaphysical characteristics, and a synthesis defining the + and –of each symbol is included. This provides the reader with an analytical, understandable vision of the various different possible interpretations. Just one word may occupy 2 or 3 explanatory pages, which makes this Dictionary very complete from all points of view. Readers will also find a detailed introduction explaining dream mechanics as well as the multiple angles and subtleties of dream and sign interpretation. Increasingly, The Traditional Study of Angels is being discussed as a philosophy for spiritual autonomy that will mark the decades to come. Distinguishing itself from books that merely pass through one’s life, The Book of Angels, The Hidden Secrets, Dreams - Signs - Meditation by Kaya and Christiane Muller, transports us to the heart of the application of spiritual life and allows us to discover that Angels, usually represented as little children with wings, are in reality Fields of Consciousness that inhabit all of us. Working with The Traditional Study of Angels is very simple. It is sufficient to repeat the name of an Angel, like a mantra, as often as possible, while meditating, walking, doing daily tasks, etc. When done on a daily basis, this recitation triggers teachings through dreams, signs and powerful expansions of consciousness that lead us to understand that, whatever name we use, God is in fact an immense Computer in which we live. The Book of Angels, The Hidden Secrets, Dreams - Signs - Meditation offers testimonials by those who practice this ancient path of Knowledge. It is an essential tool for all those who wish to understand in depth the meaning of dreams, signs and daily events. This book, a major bestseller in the field of spirituality throughout the world, is being discovered by more and more people every day and is presently being translated into several other languages. Positioning itself literally as an ageless classic, and in addition to having become a reference on Angels in many countries, this unique book is a collection of hundreds of personally experienced events and dream analyses. It allows us to discover what spiritual life is in its concrete application. 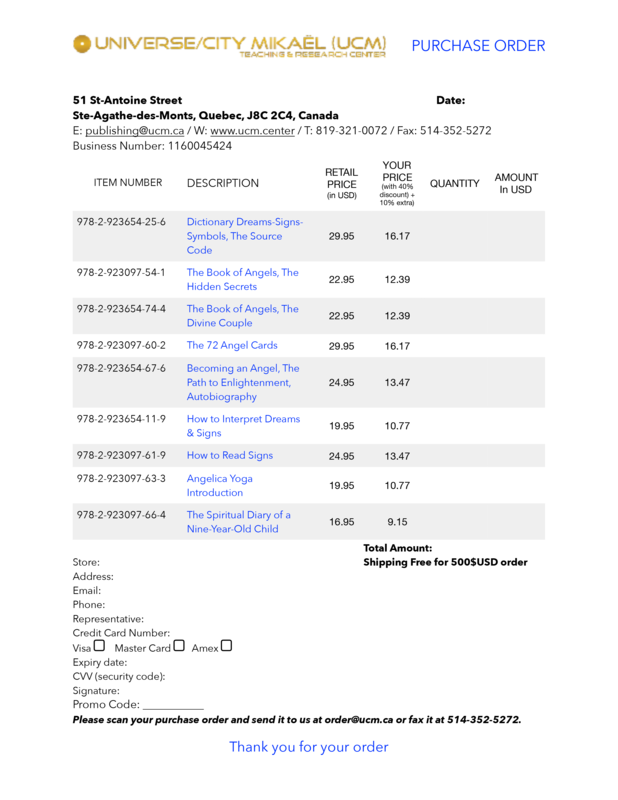 If a person asks you for a book on Angels or on the interpretation of dreams and signs, this work is the most important reference you can suggest. Would you like to develop your emotional intelligence & start remembering your dreams more and more clearly? Do you want to learn how to understand them? If the answer is yes, then all you need to do is read this book to learn how to invoke the Name of an Angel like a mantra and the answers will be revealed to you in your dreams and through signs in your daily life. By invoking the Angels, you will enter the heart of Destiny and you will activate your divine potential. You will receive continual, concrete guidance beyond anything you have ever imagined. You will realize that signs and dreams are composed of symbols and that Angels are not little cherubs with wings but a symbolic representation of our divine conscience, our multidimensional existence. With this book, you will enter the most profound ancient wisdom of love, and you will learn how to unveil and transform your own deepest unconscious wounds and secrets. You will learn a new way of seeing life by understanding the synchronicities of the Universe we live in. You will begin by integrating the fact that coincidences don’t exist… how, one day or another, we always reap what we sow… how we always attract a facet of who we are, whether we know it or not. The 72 Angel cards, Dreams–Signs–Meditation are initiatic keys that can help us in many ways. Each card enumerates the Qualities of an Angelic State or Energy, and overleaf the human distortions are listed. Angels symbolize our capacity to dream and be aware of the multi-dimensions of Life; they are also Fields of Consciousness representing Qualities, Virtues and Powers in their purest state. We can choose an Angelic State of Energy to work with by following the Angel Calendar (included in the set) based on the date and time of our birth; according to a problem we are experiencing or a quality we’d like to develop or improve; or we can simply pick an Angel card at random to see what we need to work on, or in answer to a specific question. Work with the Angels is spiritually autonomous work that helps us connect with deep memories in our unconscious and creates openings within us, which then manifest in dreams and powerful signs in our everyday lives. Through Angel Recitation (i.e. repeating the name of an Angel like a mantra), we activate Angelic Energies and Powers within us thereby increasing our capacity to dream, dream recall. We can also identify aspects of our dreams and signs and better understand their meaning through the qualities and human distortions of the Angel card we’re working with. In his autobiography, KAYA reveals in detail, for the first time, why he walked away from glory, fortune and success to become a hermit and devote himself to the study of dreams & symbols. A profound, intense, deeply moving book… for all who wish to understand a spiritual path and openings of conscience. KAYA recounts some of the premonitory dreams he’s been having for over 20 years and explains how to understand them and how to gain access to our spiritual powers. Discover the Secret Code of Dreams & Signs… KAYA is considered to be one of the greatest specialists of our time in the understanding and teaching of how to interpret dreams & signs. He is a Bestselling Author and International Speaker and his approach & journey are truly unique…He explains, “My questioning was so intense that I could have gone crazy. For years, in a life of solitude, I studied the symbols from every angle, like a mathematician trying to decode an enigma. But the real enigma was me… I had to understand my fears, my joys, and my weaknesses that were appearing in the form of symbols, both in my dreams and in my daily life. I found one of the first keys the day I told myself, ‘If everything I see and know can appear in my dreams, then the physical and metaphysical worlds share the same symbols.’ There was a code… Now, I know the code…” This book is a collection of 11 workshops given in various countries. The rediscovery of the Knowledge of signs is a philosophy destined to mark the third millennium. Because of its universal character that is accessible and compatible with any spiritual, philosophical or religious background, this ancient Knowledge can answer both today’s questions and those of tomorrow. Through simple stories of everyday life, you will learn to decode the symbolic language of signs and coincidences and you will discover that we can interpret concrete situations just like a dream. In this major work on sign interpretations by bestselling Authors Kaya and Christiane Muller, you will discover a new current of thought, and a new way of thinking that leads to profound change in our way of living. By knowing how to read and understand the meaning of signs, we can develop a personal, one-to-one relationship with Destiny. After reading this book, your life will never be the same. Discover ANGELICA YOGA Introduction, the Yoga of Angels, Dreams and Signs. For all those seeking the keys to their inner world, this book will be an exceptional work. It offers a new vision of Yoga that relates to Western lifestyle. Based on developing receptivity in action, its daily practice allows us to develop and integrate qualities, virtues and powers of the Angels in their purest state. This book presents 21 exercises that allow us to deepen the work with the origin of Angels. Angelica Yoga favors the opening of the world of dreams, parallel worlds and symbolic language. Its preface by Doctor François Bouchard is a testimony to the art of healing. A unique and fascinating work about the spiritual powers of the new children. In her first book The Spiritual Diary of a Nine-Year-Old Child, Kasara offers us her own true spiritual experience with Angels, Dreams and Signs. This inspired work helps us better understand the new generation of children, called Indigo children, or children of Aquarius, or Star children. They are arriving on Earth and shaking up the way we perceive human existence. In the words of a child, this young Author leads us to Universal Knowledge and introduces us to a multidimensional view of life. This book, written by a child, is a gift of beautiful messages and teachings meant for all children on Earth, young and old. It is also a book that our inner child will want to read and read again.